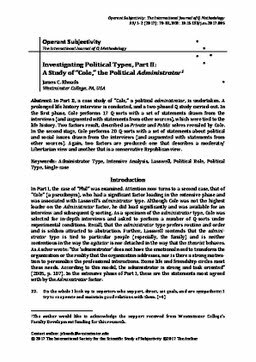 In Part II, a case study of “Cole,” a political administrator, is undertaken. A prolonged life history interview is conducted, and a two-phased Q study carried-out. In the first phase, Cole performs 17 Q-sorts with a set of statements drawn from the interviews (and augmented with statements from other sources), which were tied to the life history. Two factors result, described as Private and Public selves revealed by Cole. In the second stage, Cole performs 20 Q-sorts with a set of statements about political and social issues drawn from the interviews (and augmented with statements from other sources). Again, two factors are produced: one that describes a moderate/ Libertarian view and another that is a conservative Republican view.